No matter what people say about Linda McCartney’s voice or her presence in the band Wings, this is a beautiful love story of two people who wanted to be together and create a family and music together. After Paul and Linda McCartney married, Paul adopted her daughter from her first marriage and they produced three more children and numerous records with their group Wings. 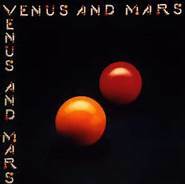 I only have Venus and Mars, which I purchased for the song “Rock Show.” The line “save for my dear old friend and confidant, Mademoiselle Kitty,” inspired me to use the word “save” in that context in some of my own writing. I enjoyed hearing the album again and had another good workout. Since I have exhausted all I have to say about Paul McCartney, maybe I should tell you about my Christmas Eve phone call from my stepmother. It was already Christmas morning for her at that time, and I had 20 minutes to go. Update-In case anyone thought me too flip regarding what I originally wrote about my stepmother here, as I now realize I was, I have removed it. I am very fond of my stepmother, and we have become good friends. Not that I think she will ever read my blog, but what I wrote wasn’t very fair to her. I apologize.